What a Pleasant Day… Two Friends & Caddies Out for a Quick 18 with their Bird Dog. The Goal? Birdies of Course. 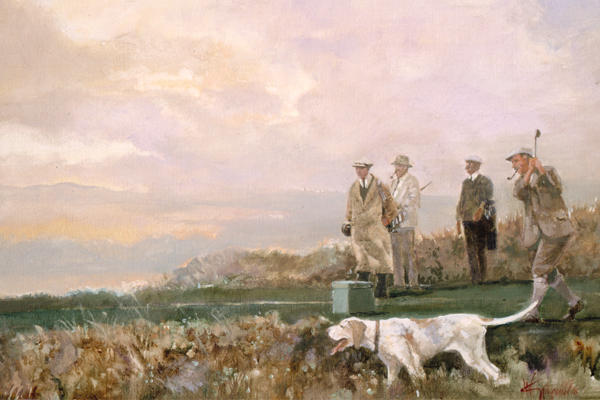 About Bird Hunting: I chose to do a few paintings with this theme after experiencing the site of a couple playing the New Course in St. Andrews one evening. I was struck by how serene that scene was, a lovely walk together enjoying a shared passion and how fussy we Americans can be about our courses. Every blade of grass was not manicured but the occasion was perfect.